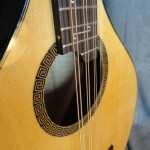 This is an Irish bouzouki with a Greek key/maze of mother of pearl on the headstock, and mother of pearl “Z’s” for fingerboard markers. The rosette is made of constucted wooden tiles following the Greek key/maze theme. 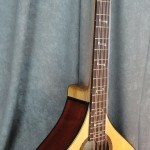 The bridge, binding, and headstock covering are ebony, the top is Sitka spruce, the sides are paduak, and the back is anegre. 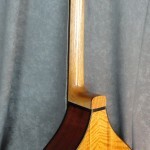 The neck is mahogany and the fingerboard is rosewood. 4 courses are tuned GDAE. 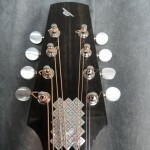 Chrome tuners with ivoroid buttons. 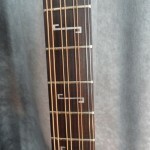 The bridge is a pin bridge with boxwood pins and ebony dots. Completed in April, 2011.